Double X Science: How important for children is imaginary play? Olde tyme tea party. 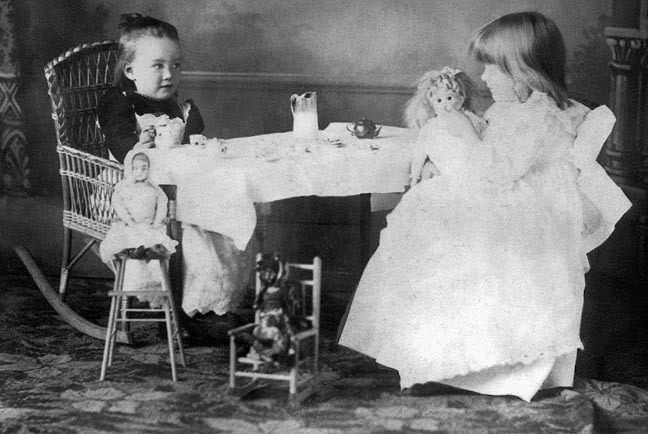 Girls engaging in pretend play, 19th c.
Photo via Wikimedia; public domain in US. Did you engage in imaginary play as a child? A recent study--which like the organic foods study involved evaluation of existing reports in one big chunk--has led its authors to conclude that imaginary or pretend play doesn't seem to boost intelligence, creativity, or the ability to tackle problems. The researchers did find that such play might be beneficial for language and social development, storytelling, and self-regulation. Their findings are set to appear in the Psychological Bulletin (abstract here). When you look at the research that has been done to test that, it comes up really short... It may be that we've been testing the wrong things; and it may well be that when a future experiment is really well done we may find something that pretend play does for development, but at this point these claims are all overheated. This is our conclusion from having really carefully read the studies. To me, this finding isn't that surprising. Intelligence, creativity, and addressing problems can be the activities of a brain on its own, reinforced through solo pursuits within the real world like reading, self-directed learning or hands-on activities, or even watching certain television shows. But while children can, of course, engage in imaginary play on their own, "play" as we generally think of it tends to involve interaction and even practice with other people. any play a child engages in, alone, with playmates, or with adults, that involves uses of the imagination to create a fantasy world or situation, such as making toy cars go “vrrooooom” or making dolls talk. Whether we're talking about lion cubs or children, about pretend play or just rolling around in a pile, these interactions guide a number of social behaviors, communication, and bonding and help young animals orient to the world around them (PBS video about play here). In addition to social interactions, storytelling is another feature that I can easily see would sharpen with imaginary play, particularly with an increasing understanding of what an audience is and how they respond. And even though the term might imply otherwise, self-regulation is something we generally don't acquire by ourselves. We learn a lot about how to control what we present through feedback from others, including parents and peers. What's unclear to me is what intrinsic factor pretend play might have that goes beyond non-pretend social interactions to reinforce self-regulation. The NESCA post notes that an absence of pretend play is still a red flag for developmental conditions on the autism spectrum, particularly if noted between the ages of 18 months and 2 years. With an anecdatum alert, my oldest son is on the autism spectrum and engaged in pretend play. He just did it ways that in retrospect stand out as unusual for his age--and he still does. A lack of pretend play in a toddler is not pathognomonic--a definite indicator--of autism (nothing is), but if you have concerns about it, ask your pediatrician about an evaluation. Do the findings of this large analysis surprise you? Had you thought that pretend play might boost creativity or intelligence or problem-solving skills? If you have a child, does she or he engage in pretend play?